Charitable inspiration can come in almost any form and at any time. The seed that sparked in Wayne von Borstel was the book, Three Cups of Tea. Though the author would later be discredited for not being entirely truthful, it had already inspired von Borstel and his wife Marta with a new charitable purpose. They would provide underprivileged children, some in the most remote regions of the world, access to educational resources and hope, from a Christian perspective, to transform their lives. The seed began to sprout and soon led Wayne and Marta to partner with a friend tasked with traveling abroad to find fellow Christians working to provide children with much-needed assistance. Their journey brought them to the Island of Sumatra, on the outskirts of Medan, Indonesia where he learned of YASAH Orphanage, home to over 100 children who had lost their parents as a result of several natural disasters in the area including earthquakes, tsunamis, and a volcanic eruption. Wayne and Marta’s ongoing financial contributions to the orphanage have made it possible for YASAH to complete the construction of a new church and school facility. They also fund the ongoing expense of feeding the children on a daily basis and college tuition for five of the older orphans. Today the orphanage has expanded its outreach to the surrounding Muslim community with their school which is attended by over five hundred children daily, 80 of which live at the orphanage. von Borstel’s clients often come to him planning to leave their entire estates to their children. When asked if their heirs will know the difference between receiving $1.1M or $1M, von Borstel often witnesses the “aha” moment that sparks his clients to change their plans. “When they realize the potential for even 10% of their wealth to transform the lives of others, they want to make it happen,” explained von Borstel. Since embarking on his charitable journey, von Borstel’s mission has expanded. 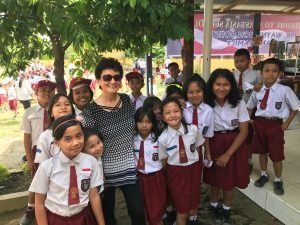 “It is my life’s dream to inspire and plant 1000 seeds of giving and hope, whether that be in the children at YASAH, the other charities we support, or in my clients,” said von Borstel. To learn more about YASAH Orphanage, please visit www.yasah.org.